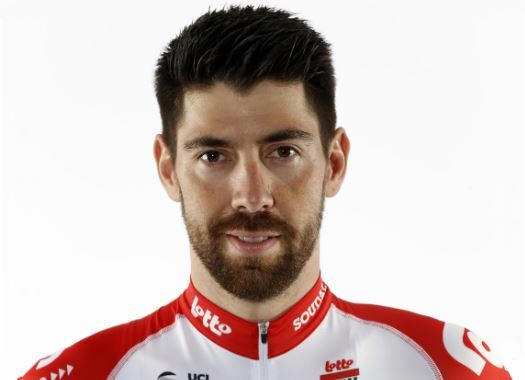 Thomas De Gendt (Lotto-Soudal) showed once more why he's considered one of the best breakaway men in the peloton on the first day of the Volta a Catalunya. He wasn't only part of a strong escape group but survived by himself until the end. De Gendt was one of the men that formed the escape group of the first stage of the Spanish race but rode in a way that left everyone else behind and made it impossible for the peloton to catch him. "I absolutely wanted to be in the breakaway today to aim for the stage win," De Gendt commented. "I tried to take the mountains jersey as well, but I did not want to waste too much energy on this. The peloton quickly brought down our bonus to two minutes, but I did not panic. The hardest part was yet to come, being a short and steep hill. I was riding at a very high pace there, hoping the strongest would survive, but only Luis Maté was able to follow. "However, he could not take the lead anymore and he just stayed in my wheel until the next hill, the Coll Formic. Because I knew Maté really was at his limit, I attacked again and he had to let go." "On the first day, there is no GC leader yet, so then it is difficult to find a team willing to lead the chase. For the sprinters, it was a bit too tough today and I responded well to that. On top of that, I think the GC riders will not care too much about me. The two uphill finishes could make me lose fifteen minutes, so it does not really matter that I am two minutes ahead now. Tomorrow I should keep the leader’s jersey, but I suppose I will not be able to follow the top riders on the next day."